Did you know? 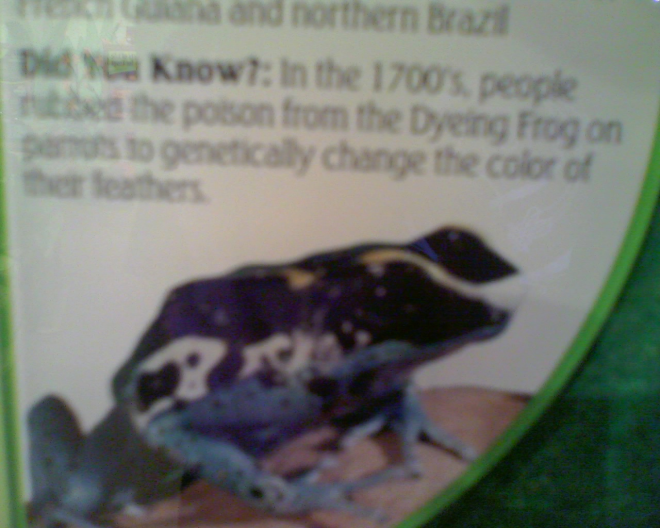 In the 1700's, people rubbed the poison from the Dyeing Frog on parrots to genetically change the color of their feathers. genetically? is that an appropriate word? This is the aptly named dyeing frog, Dendrobates tinctorius, one of the poison-dart frogs. Its skin contains a cocktail of alkaloid poisons. Like many alkaloids, these are mutagens. Applied to the rapidly dividing cells in a growing feather, they cause a local genetic change -- and a colour change in the parrots' feathers. this is indicative of my main complaint about visiting the aquarium yesterday -- often there were interesting things in the tanks, with little-to-no information available. i'll say more later, when i post my pictures.